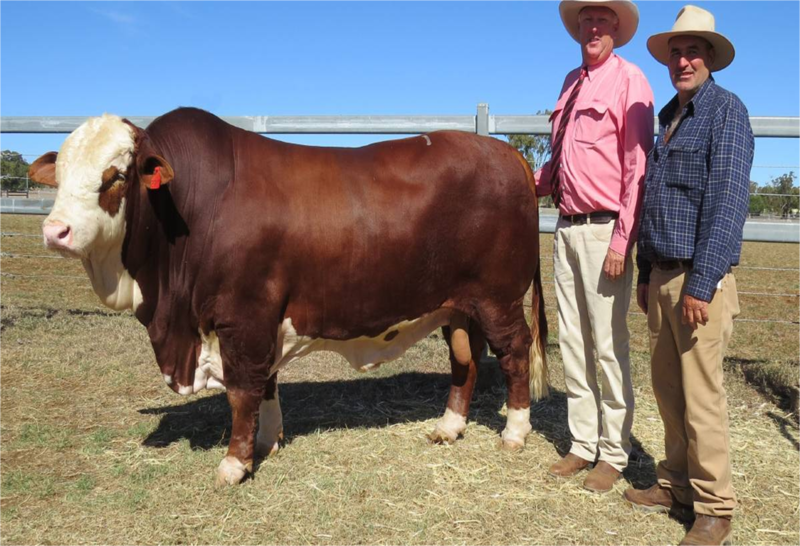 THE National Braford sale was held in Gracemere today, with 125 of 149 bulls sold for an average of $7056. The sale grossed $882,000 and cleared 83 per cent. Top priced bull was lot 99, Carinya Sweeney, a polled bull offered by the Amor family who weighed 926kg, with an EMA of 130sq cm, and a scrotal circumference of 41cm. He was sold to Brian and Trinket Anderson, Glenduan, Theodore, for $42,500. There was a two way tie for second top priced bull, with two selling for $26,000. Little Valley Foster, a 1032kg bull of 30 months of age boasted an EMA of 140sq cm, and a scrotal circumference of 39cm. He sold to Warren Wilson, Redbank, Mitchell. 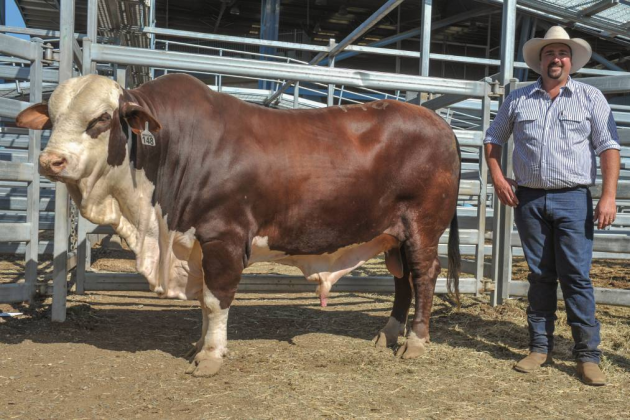 Also selling for $26,000 was Carinya Theo, a bull boasted 810kg of red meat with an EMA of 117sq cm, and a scrotal circumference of 37cm. He sold to Jack Meek, Cargara, Augathella. The volume buyer of the sale was Paul and Janice Anderson, Eureka Grazing, Alpha, who purchased eight bulls grossing $46,000 for an average of $5750. Amongst the eight bulls was Carinya Sanders, which they paid $16,000 for. Each going home with six bulls apiece were Tigrigie Cattle, Moorabinda, Taroom, ($45,000 gross, average $7500), John Murray, Oran, Richmond ($25,000 gross, average $4083), B and A Galloway, Barrain, Blackwater, ($18,000 gross, average $3000), and S and G Jones, Forest Home, Marlborough (gross ($18,000 gross, average $3000). Selling agents: Landmark, Elders, and SBB. Martin Bunyard29 Aug 2017, 2 p.m.
Over 50 buyers registered to purchase stud cattle at this year’s New Dimension Braford Sale at Bell last Saturday. The multi-vendor sale included the Amor family, Carinya, Dulacca, Donovan family, Ashby, Jimbour, the Hoffmann family, Downfall Creek, Guluguba, the Knauth family, Oakey, Little Valley Grazing, Casino, NSW, the McNamara family, Strathgyle, Bell, N Pacholke, Sunnylawn, Clifton, the Roddau family, Lime Vale, Dalby, R Ryan, Banyula, Emerald, the Skerman family, Wandoan. A total of 20 Bradford bulls and 47 females were on offer at the sale. 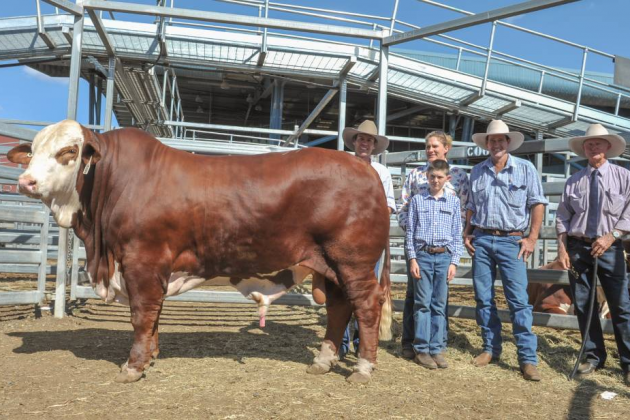 The Amor family, Carinya, Dulacca sold the top price bull for $18,000, which was the first sale lot of the day Carinya Stirling bull (P). 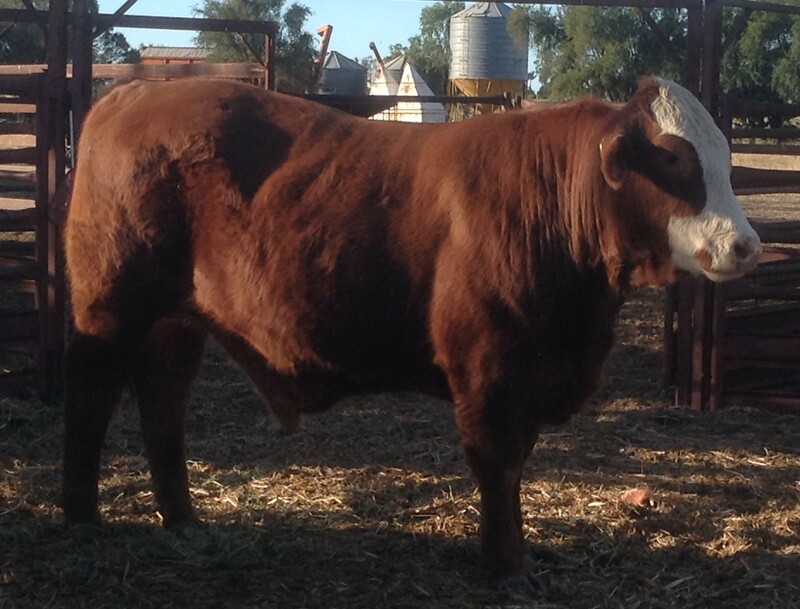 The sire was purchased by Jack Meek, Cargara Cattle Company, Cargara Station, Charleville. Cargara Cattle Company also bought the equal top price bull, Lot 20 Carinya Turvey (S), for $18,000 from the Amor family as well. Overall, the sale grossed for the bull section $102,850 with a sale average of $7346 and the clearance rate of 93 per cent. Top price female of the sale was also the first lot sold in the section, 19-month-old Corinda 2849, for $5,000 to Stewart Anderson, Devils Nest, Theodore. Overall, the registered Braford females sold for a gross of $84,000 and an average of $2400 with a clearance rate of 95pc. Second top priced registered female of the sale was Carinya 2827 for $4750 and sold to the McNamara family, Strathgyle, Bell. Nine commercial Braford females made 100pc clearance and topped $1,600. 14 Aug 2017, 1:30 p.m. The largest eye muscle on the RNA grounds at the Ekka is something normally associated with the pure European breeds being exhibited, but it’s a claim that the Braford breed was able to make this year. Little Valley Milford, weighing in at 1052kg, dominated the Braford judging with his eye muscle area of 150 square centimetres. It was a meaty amount only nearly matched by a Limousin bull with 148 and a Brangus bull on 147. The claim to fame topped off a good showing for Cameron Bennett’s Little Valley Grazing Co in particular, and the Braford breed generally, which had four times the number of entries in the ring this year as last year. As judge Glen Pfeffer said, if ever a breed was evolving, it’s the Brafords. 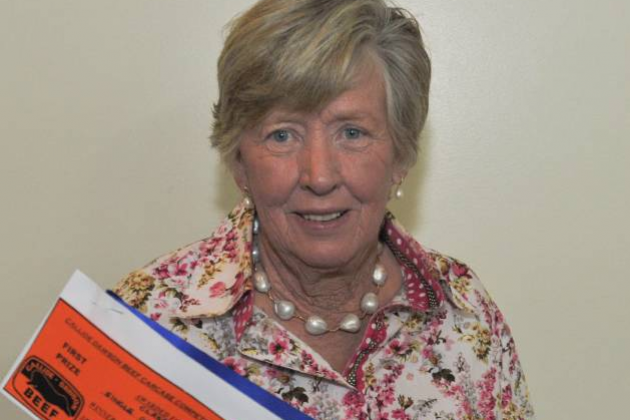 “I feel sure that when that meeting was held in Rockhampton in 1962, to start the breed society, the people there would never have envisaged what the breed would be doing today,” he said. “It’s a breed that I’ve watched ever since I was a kid. “Today we’re seeing that polls are to the fore, along with that slick coat and tight sheaths. It was an outcome that winning breeder, Cameron Bennett, was pretty happy with. “The eye muscle is the main cut so it’s very important to get that right,” he said. 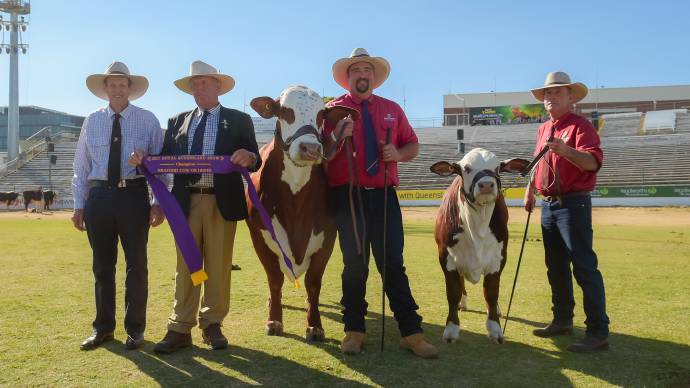 The New South Wales stud won all but one of the main awards on offer in the judging arena, claiming champion cow, reserve champion cow, champion bull and grand champion exhibit ribbons. The stud is well-known in the Ekka ring, having won the major prizes many years in a row. Most of its ribbons went to Little Valley Milford, who was fathered by Taroela Lawson, a 2005 purchase that has been doing a tremendous job for the stud as a sire. “Milford is one of the last of his sons, and we’ll be taking him to the national Braford sale in Rockhampton in September,” Cameron said. He will also go with the broad ribbon for supreme exhibit at the feature show at Warialda in New South Wales in May this year. Right alongside him was Little Valley Brie, judged the champion cow or heifer of the show. Without any irony at all, judge Glen Pfeffer described Brie as “oozing quality”. She too boasted Taroela Lawson as her sire. Stablemate Little Valley Miss Deeva, the winner of the younger 16 month to under 20 month class, was the reserve champion cow or heifer. The McNamara family. based at Bell, claimed the reserve champion bull ribbon with Strathgyle Benefactor. In the 16 month and under 20 month class, he hit the scales at 738kg and has been growing fast with an average daily weight gain of 1.31kg. His EMA was 118 sq cm. The Bellray stud, based at Manilla in New South Wales, was the breed’s third exibitor. 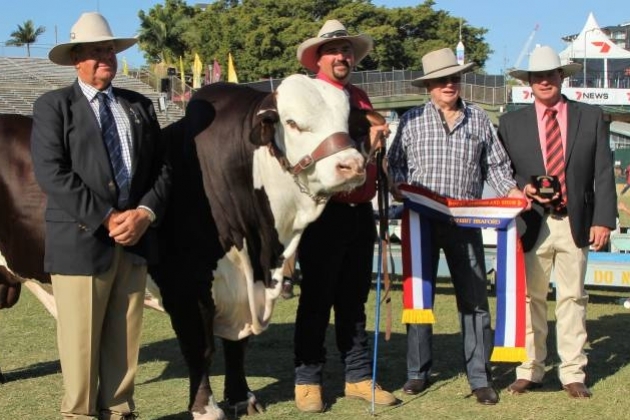 The story Braford champ claims Ekka’s largest eye muscle first appeared on Queensland Country Life. 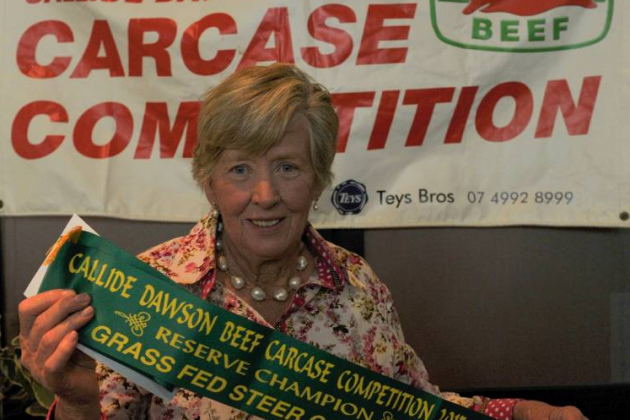 Rhonda Ryan, Banyula Braford Stud, Emerald took out the Jap Ox Grass-fed steer and went on to be the Reserve Champion Grass-fed Carcass. Rhonda’s other entries placed fourth and eighth in the Trade Steer and fifth in the Grain Assist Steer Class. Jill, Graham and Dan Galloway followed up their win in the Trade steer class last year with a second in the same class this year. A three-way crossbreeding program is helping improve production outcomes for a Queensland central highlands cattle operation. 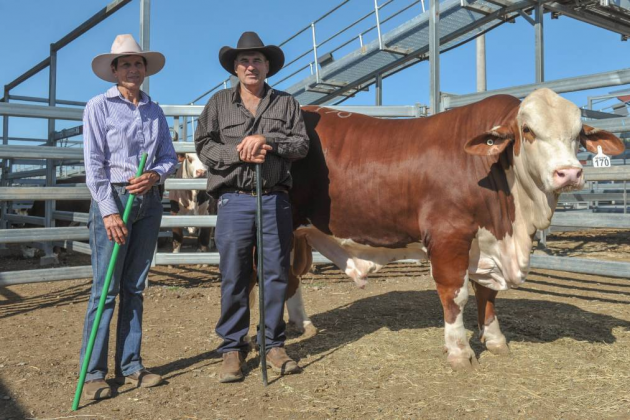 John and Jan Burnett, Bendemeer, Clermont, run a 10,000 head Braford based cow herd and cross Brahman bulls. They then use a third-way cross with Charolais and Simmental bulls to produce crossbred cattle that perform well in their production system. The family owned cattle business also runs 20,000 head of commercial cattle across their 162,000 hectares around the Clermont district. Mr Burnett said the three-way crossbreeding program returned high heterosis value and consistent hybrid vigor in their cattle production systems. 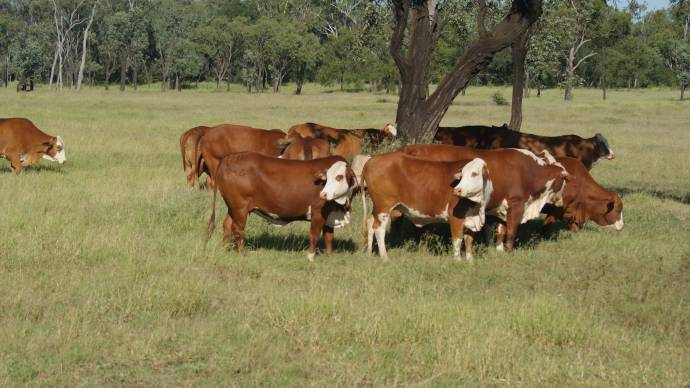 “We can maintain about 80 per cent of available heterosis using this crossbreeding program, which is very valuable to our cattle operation,” he said. Mr Burnett added this type of breeding program sometimes required the addition of extra bulls during the mating season, which starts in early December. The Burnett Group often use the February All Breeds sale at Gracemere to source any extra bulls. “Our main purchases of bulls is during the September to November months. We breed our cattle in early December, but if we need extra bulls to top-up we buy them at the February All Breeds sale,” he said. “We normally purchase a fair few store cattle in as well, but recently we’ve increased our breeder numbers slightly and dropped back on the cattle purchasing program. 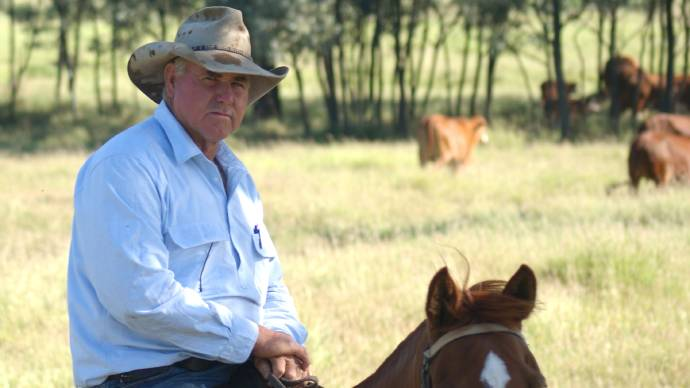 Also putting pressure on the Burnett family’s cattle operation has been a two year dry weather period, which has resulted in them decreasing cattle numbers by 20 per cent. “It has been dry across all our properties for the past two years and we urgently need a wet season to get strength back into our pastures,” Mr Burnett said. The Burnett family hope once normal seasonal conditions return, after the dry period, they can continue to increase the operation’s breeder cow numbers. “Cattle prices are good at present, so we have to assume the season will get back to a normal pattern,” he said. “We will adjust stocking numbers to the amount of pasture we have available at the end of February.